Two states and a handful of cities do not a country make. Democrats have carried the popular vote in six of the last seven presidential elections, an unprecedented run. But, Democrats are confronted by the “wasted vote phenomenon”. They roll up huge margins in blue enclaves, but political polarization and demographic sorting control the electoral map. Clinton’s 3 million-vote edge came from but 420 of our 3,100 counties. The 16 percent of counties supporting Clinton accounted for 65 percent of U.S. GNP, and their median home price was 60 percent higher than in counties carried by Trump. 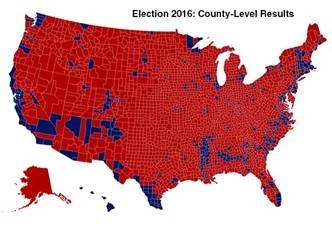 Studies have found that there’s a direct correlation between the percentage of “underwater” homes and counties that voted for Trump. We are “increasingly sorted into think-alike communities” defined by ethnicity, education, and economic status. The Democrat’s economically ascendant counties, largely urban, are geographically isolated islands of the relatively privileged surrounded by the less educated and more aggrieved who must dog paddle to survive. And so geography (and the electoral map) mirrors demography. 92 percent of Republicans are to the right of the median Democrat in their core social, economic, and political views. 94 percent of Democrats are to the left of the median Republican. Two-thirds of consistent conservatives and more than half of consistent liberals say most of their close friends share their political views. Rule #11: Never let the enemy score points because you’re caught without a solution to the problem. See our prior post Another Chicago flashback … for the rest of Alinsky’s “rules”. This entry was posted on February 16, 2017 at 6:59 am and is filed under 2016 Presidential Election, Demograhics. You can follow any responses to this entry through the RSS 2.0 feed. You can leave a response, or trackback from your own site. Great article. I think #11 applies to Republicans as well. After years of opposing the Affordable Care Act, they now have to identify a viable solution to that problem. Which is, of course, much harder than simply railing against it. There are not only islands of “affluence.” Democrats also own islands of poverty and violence in some cities and in the south, where they work hard to perpetuate dependence on government handouts. Concerning Obamacare, now that the genie is out of the bottle it is difficult to put it back. Obamacare expanded government entitlements and subsidizes the sickest. It is almost impossible to roll it back as they have created huge new interest groups. “Demographic sorting” sounds a lot like gerrymandering…which is not a natural phenomenon but the result of corruption. Geography does not vote. Nor should it. The only consideration in an election should be how many voted for whom. The graphic in this article that shows a red expanse should be adjusted for population, not square miles. It would then be over half blue. Obamacare did not “create a huge new interest group”. It simply identified it and gave it hope. “The only consideration in an election should be how many voted for whom”?? Our country has succeeded precisely because this isn’t the case. If popular vote is all that matters, then it’s only fair that we apply that theory across the board. How about scheduling a series of referendums? After the next terrorist attack, we can vote on a Muslim registry – do you think we can get 50.1% to vote for that? Immigration, 3rd bathrooms, abortion – insert any social issue of your choice, what for an emotional event, get 50.1% to vote yes, then tell the other 49.9% to piss off. Another way to say “majority” is “mob”, and we need to be better than that. I am not sure how my comment on “the only consideration in an election” was translated into “everything has to be decided by election”. That was not my point, or would it be my desire. However, if you are going to have an election, and then simply ignore the majority(50.1%) rule in favor of some other deciding factor then what is the point of having an election?. I think conceptually the two ideas are related. Whether a referendum on a particular issue, or the election of a President, our country is too diverse – geographically, racially, religiously, economically – for a 50.1% popular vote system. People in Montana have different problems than those in New York, who have different problems than people in Ohio, than Vermont, Mississippi, etc. If all that matters is sheer number of votes, then candidates would only cater to the largest population centers. Eventually, there would be ~ 20 states that no candidate, nor any President, would ever step foot in. It would serve them no purpose, and in time those states would not be represented by their government. We have to find a way to be better – to be more inclusive and accommodating to other needs, beliefs, etc. I just think a straight up popular vote will cause a death spiral – it would become more polarizing with each successive election. I don’t think they are related at all except both involve votes. But as long as we are off on this tact, you got your wish. The founding fathers thought like you. That is why they developed the Electoral College which gives a disproportionately greater role in electing a president to small (read lower population, not geographical) states. Because of the Electoral College a vote in Montana is clearly worth more than a vote in California. What you end up with just that however is, ironically, mob rule and the ruling mob is a minority. That is who elected Trump, a minority when compared to ALL voters, (but he still got a plurality). And to the mob’s credit, they also elected people like Lincoln, another minority president. Fortunately for you (us?) right now the Electoral College is not the only thing saving us from majority rule. When coupled with other American governmental innovations like separation of legislative, judicial and executive powers: and like a Senate that gives a small state the same representation as a large one. However, gerrymandering, intimidation of judges, campaign financing and other corruptions are eroding those protections away. BUT, with all that considered and with all the various ways we have of ultimately assigning value to a vote. I still believe, as was my original point, the graphic in this story is misleading. Misleading presentations like this have apparently convinced our current president that he was elected in a massive landslide. There is no way we are going to get (back?) or to a more inclusive and accommodating government unless we show things like the really are.